If there’s one thing I love about Delia’s recipes it’s the satisfaction of creating a dish that looks just like the photo from her Delia On-line recipe archive! We were first introduced to Delia’s one pot Basque Chicken by our friend Alice who seemingly whipped it up out of nowhere when we visited one Saturday. While the kids played and we chatted in the kitchen she browned off some chicken thighs and chopped some peppers. After a brief interruption from Euan I returned to the kitchen to find Alice popping her full casserole dish in the oven. 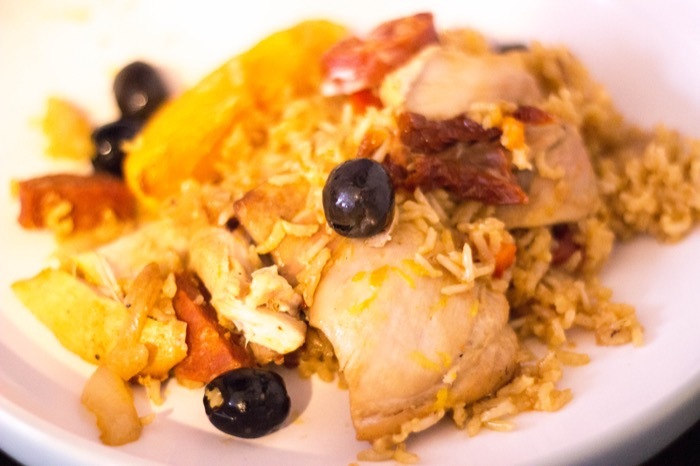 An hour later she pulled it out again and 4 adults and 4 children were soon tucking in to this lovely spanish blend of chicken, chorizo, peppers, and olives soaked brown rice. Delia’s original recipe uses a whole jointed chicken but we like to use skinless, boneless chicken thighs which are not only cheaper but suit the flavours and texture of this dish and require no preparation. I also omit the hot paprika and wine find this makes it more agreeable as a family dinner with small children. I did include wine for the making and photographing of the dish for this post but couldn’t honestly say it made all that difference that I could notice so will continue to omit it in future. Season your chicken with salt and pepper. Heat two tablespoons of oil in an ovenproof casserole dish and brown off the chicken thighs. Remove to a plate lined with kitchen paper. Slice the red peppers in half, remove the seeds and pith, then slice each half into six strips. Likewise, peel the onion and slice into strips of approximately the same size. Drain the dried tomatoes, wipe dry with kitchen paper and cut into ½ inch (1 cm) pieces. 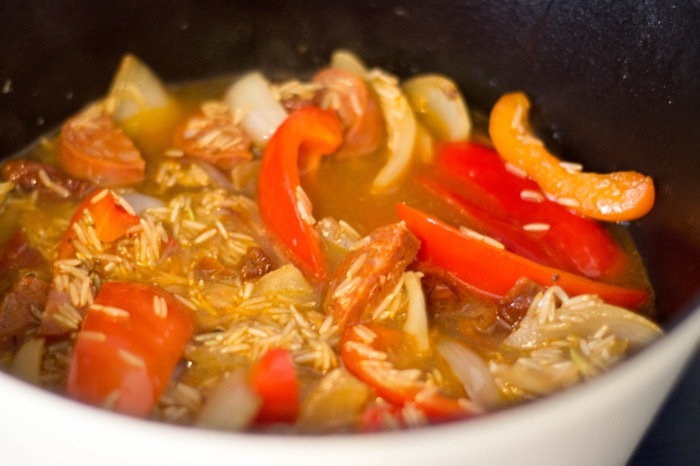 Add a little more oil to the casserole dish, at a medium heat and when the oil is hot, add the onion and peppers. Allow them to brown a little at the edges, moving them around from time to time, for about 5 minutes. After that, add the chorizo, sun-dried tomatoes and garlic and toss these around for a minute or two until the garlic is pale golden and the chorizo has taken on some colour. 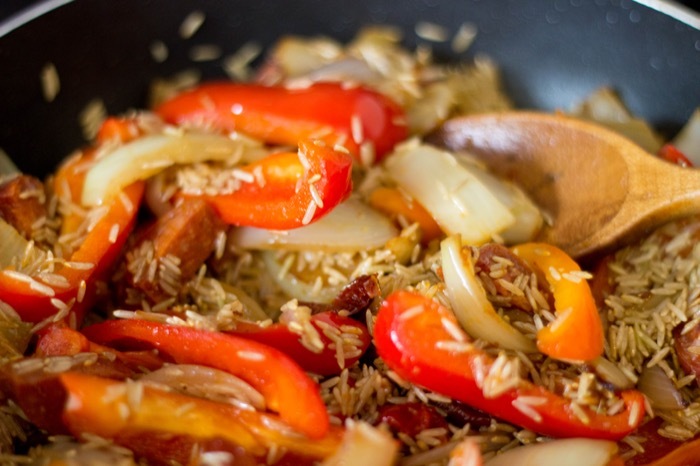 Next, stir in the rice and, when the grains have a good coating of oil, add the sun-dried tomato paste, paprika and chopped thyme. Pour in the stock and wine, and add some seasoning. 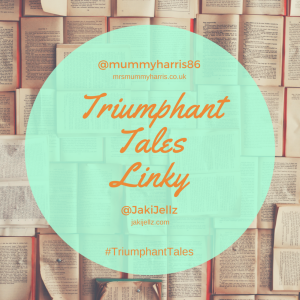 As soon as everything has reached simmering point, turn the heat down to a gentle simmer. Add a little more seasoning, then place the chicken gently on top of everything (it’s important to keep the rice down in the liquid). 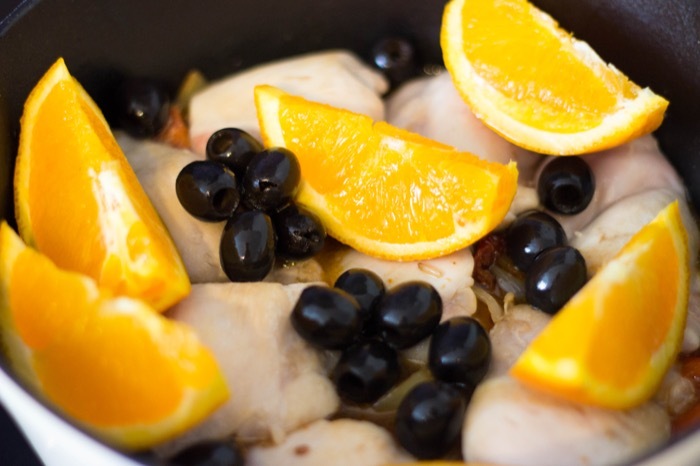 Finally, place the wedges of orange in among the chicken and scatter with the olives. We enjoy this dish with some steamed greens or broccoli but it’s just as good as a stand alone dish.